Please visit here often for the latest on what John Atkin is working on or exhibiting. Also below highlighted in grey are exhibitions and pieces that are available to view in the library or are also case studies as above. The web link, http://www.britishcouncil.org/china-arts-activity.htm is part of the Ordos City Sculpture. Hard Bop - Commission in California. Development in San Francisco, at Fillmore Plaza. I will be working on producing a series of seating and planters for the site. 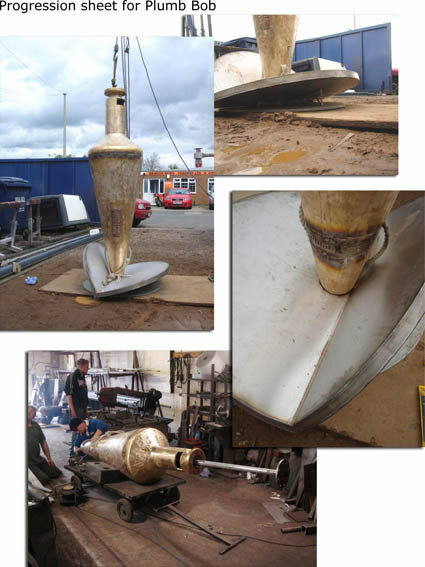 The sculpture is scheduled to be in place October 2008 and it will be made from stainless steel. Or see a short film sting here on YOUTUBE. This new sculpture by John Atkin nears completion and will be moved to the Olympic Park site in June, just prior to the opening of the Olympic Games. The sculpture weighs 27 tons and is made from a combination of marble and granite. Please see main web site for further details. I have a Solo show coming up at Albermarle Gallery, London, www.albemarlegallery.com with a new publication. This is a survey exhibition of Atkin's maquettes and how they relate to the process of making public art. These sculptures have never been exhibited collectively before and this is an opportunity anyone to take a close look at the artists working process. A publication will accompany the exhibition with a scholarly introduction by Edward Lucie Smith. John Atkin, Reader in Fine Art at Loughborough University, has been selected from 2,600 applicants to create a new sculpture for the major exhibition at Olympic Park, Beijing later this year. His initial designs received an outstanding award from the judging panel. The sculpture weighs 27 tons and is carved from marble and granite. It takes its inspiration and name -Strange Meeting from a poem by Wilfred Owen. The poem tells of a dramatic meeting between two dead soldiers who had fought on opposing sides. No longer enemies, they find it possible to see beyond conflict and hatred in a shared awareness of "the truth untold". The Chinese workforce were tremendous their attention to detail and ability to translate the subtle shifts in form of the sculpture was a remarkable achievement. It was also great to meet a number of artists from other parts of the world said John. Its great to see the Beijing Olympics stimulating new work from artists around the world said Clare Hudson of Creative Leicestershire. Similar opportunities for cultural activities around the UK are being planned for the London Olympics 2012 will be another exciting time for both culture and sport. The public art exhibition launches in May 2008 and is based on the 2008 Olympic theme of One World, One Dream. Johns sculpture allows people to walk through the spaces between each element of the sculpture. The two identical, shapes, based on garment template contour patterns, are cut from the same veined block, turned inward on each other. John Atkin has recently been awarded the prestigious Rootstein Hopkins sabbatical Grant for his drawing output. 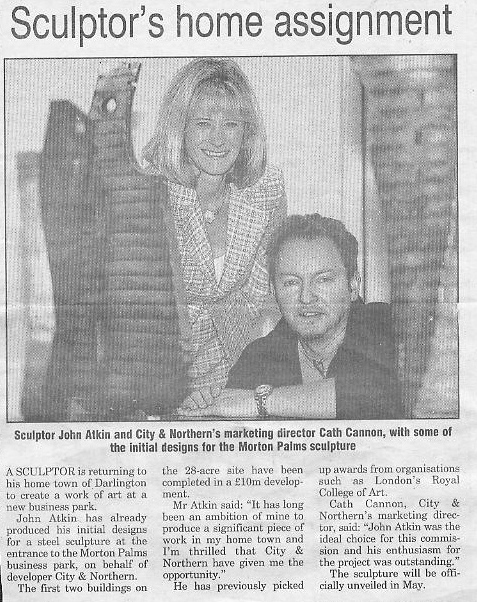 This highly sought after award is in its final year and Atkin will commence work on a series of fresh works on paper October 2007. Atkin will develop his use of collage in relation to his drawing, and combine this with digital manipulation of imagery stimulated by contemporary and historic found objects. This fresh body of work will further develop his interest in the objet-trouve tradition into large-scale works on paper, which will be exhibited next year. An invitation by Tesco Ireland to explore the socio-economic legacy of Ireland’s former major employer was the theme for this body of work. 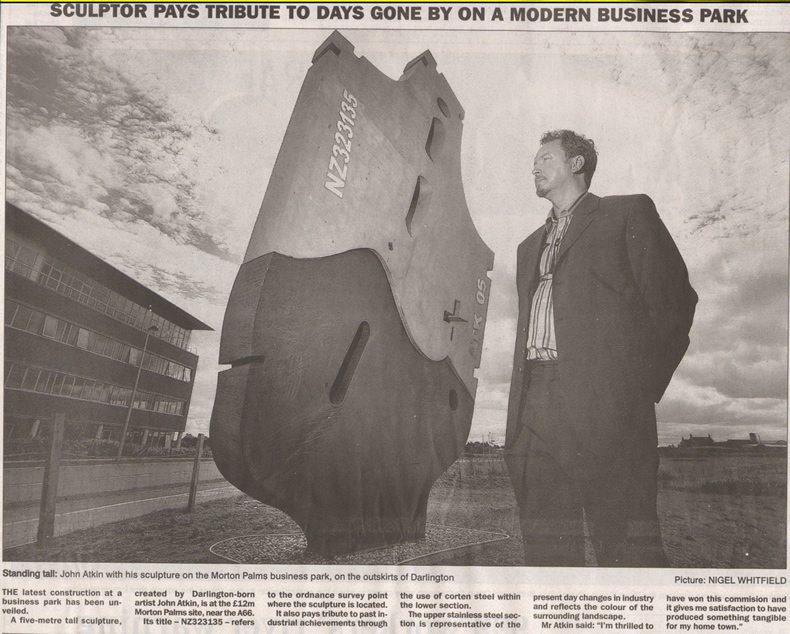 The final output, an 18 feet tall, 3-ton sculpture, fabricated from a combination of corten, stainless steel and oak, is located at the heart of Wexford City, at the now demolished site of Pierce Engineering. My interest in the found- object tradition in Modern and Contemporary sculpture, as well as my growing interest in urban regeneration projects as the platform for public sculptures that explore notions of the human condition, stimulated a series of drawings and small-scale sculptures that examined the industrial and agricultural legacy of Pierce Engineering. Specific industrial archaeology has been a key research dynamic of this project, which tests the ways by which public sculpture can visually articulate the industrial identity of a community and its histories. My research led to a period of empirical study in Wexford and at Johnstown Museum, funded by Tesco Ireland, in order to identify relevant archive material that could be used as a stimulus for the proposed artwork. Important component parts derived from this archive have been used in order to convey machine inspired shapes and forms that elucidate on the human figure. In broader terms, the sculpture and associated street furniture, (which forms part of the coordinated landscaping of the site by John Atkin and Murray & Associates, Landscape Architects), aims to establish links, as well as common themes of “identity”, between the artwork, architecture, history and the community. Continuing from the well received Otmar Alt sculpture in 2006, Lister Park will once again host large scale works for the summer period. Look out for another Otmar piece and related education events. John Atkin’s industrial piece reflects on cultural identity and geographical location. Large eyes by Bruce Williams provide stories of love, devotion and heartache. Artwork to enjoy whilst in the sun surrounded by our gardens. John Atkin has recently been appointed Fellow at the Royal British Society of Sculptors. This peer elected award follows on from his recent successful solo exhibition at the RBS where he exhibited a number of new works on paper and a series of sculptures. The Royal British Society of Sculptors is a registered charity, which exists to promote and advance sculpture in all its forms. It has a worldwide membership ranging from those at the peak of their profession to those who are just emerging. Interior and exterior exhibition space with an annual programme of five shows of sculpture from the traditional to the cutting edge. Wide programme of events and educational activities including workshops, lectures and gallery talks. A resource centre for contemporary sculpture, including visuals, catalogues and CVs of all members. to promote the pursuit of excellence in sculpture and its practice. The new Land Registry building in Croydon is a major architectural feature within topography of the town, designed by PRC Architects Ltd and DBK Goyne Adams. Its scale, colour and use of materials demanded a site specific sculpture that explored the space as well as the function of the building. John Atkin was selected from an open competition to pursue an idea that related the geographical location of the building to the artifacts associated with surveying. The linear structure of the building was also a formal consideration when exploring a concept for the space. Atkin developed a series of ideas based on ancient and contemporary plumb bob's. He liked the idea of a defunct functional object that addressed the vertical nature of the building and also something that made sense when positioned perpendicular to the ground. His 14 feet tall sculpture, which is a combination of cast bronze and stainless steel acknowledges the space in terms of it s use, its history and architectural style. The sculpture is positioned in such a way to suggest it has been dropped from the top of the building and has impacted on a specific ordinance point, pinpointing exact location and historical heritage. I have been working as Lead Artist for Kent County Council on the Breaking Boundaries ring road project in Ashford. This has involved collaboration with Landscape Architects, Whitelaw Turkington on a series of land-forms and street furniture that comment on the industrial heritage of Ashford. I have won a competition organised by the Friends of the New Walk in Leicester, to make a new bronze sculpture for a prominent site in the New Walk, leicester: celebrating the British Shoe industry. This was a national competition and my designs, which involved the development of a figure-based sculpture, inspired by shoe contour patterns. April 2006-Sept 2007 I have been awarded an Outstanding Award from the Beijing Olympic sculpture Committee for my sculpture proposal for Olympic Park. This was part of an international competition organised in Beijing for sculptors to make works for the forthcoming Olympic Games. Commissioned by Spellthorne Council as part of a nationally advertised competition for Pound Mill, a site of historical significance in Staines. The sculpture is a combination of industrial imagery and a use of materials evocative of the sites former use as a mill and its proximity to the site of the early rail network in SW London. The sculpture is a mix of different metaphors, founded on observational studies of octants & sextants, mill gear pulleys and early railway imagery. This sculpture, due for completion in February 2006, will be located adjacent to a busy traffic route into Staines and close to the meeting of the two rivers. As such, it will be the focus of pedestrian and vehicular traffic at different time s of the day. Spellthorne Council are keen that the sculpture becomes a signpost for this part of Staines and turns what is currently a “space” into a “place” for the community and visitors alike. Sculpturesite Gallery is San Francisco 's only venue dedicated entirely to modern and contemporary fine art sculpture, representing over thirty mid-career to internationally renowned artists. The landmark indoor-outdoor gallery is located one block from the San Francisco Museum of Modern Art and the Yerba Buena Center for the Arts, across the street from the Moscone Center.